Beautiful creations for Christmas which will carry you through the winter time blues.. 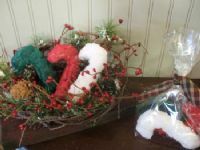 Fantastic gifts, reale, and or add to existing baskets! Turn around time - 14 to 16 business days. money through Paypal. Save on shipping. PayPal will take any card, you do not need an account. Measuring approximately 5 3/4" high and weigh around 1 lb. A gift which will be remembered for all time..
Each dressed with a scarf, little twig arms and an adorable rusty star on the scarf. Artistist painted on the Nose & Eyes. Highly scented creation will scent a small room! 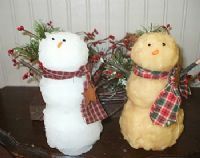 Our Price 20.00 each lot - Sold in Lots of 2 - Give for winter gifts and keep one for yourself! Make great work place gifts, wedding favors, teacher gifts, and all the rest. Flat rate shipping. Shipping Time - Up to 16 business days during holidays. List of Lisa's Scents can be found at the bottom of this page. request for money through Paypal. You will receive 12 Iron Star Tarts that measure approx. 3" across. 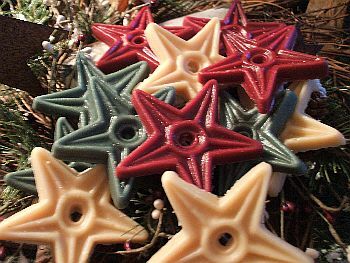 Great to be used in potpourri, decorate on a plate or bowl or melt them in your tartwarmer for a wonderful aroma! Packaged in a clear cello bag with a brown kraft label that has the scent name. 12 per bag. Each weigh approx. .08 oz each. Entire bag weighs about 8 oz. 14.95 plus flat rate shipping 11.45 first dozen. Faces, Pine Cones, Snow Balls, or Christmas Tarts, please put your selections in the add a note box. Your choice of 1 scent per dozen. List of scents at the bottom of this page. We combine shipping, but you have to send an email with your order and we will send you a request for money through Paypal. Each are hand molded and weigh between 1.4 oz - 1.5 oz. These tarts are big and are full of scent! Can be used in a bowl, or melted in a tartwarmer! These measure about 2 3/4"-3" across. Because of being hand molded size can vary. selections in the add a note box. Scent list at the bottom of this page. Pinecones measure 1" high, and about 1" across. 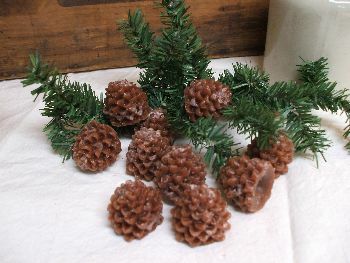 Each Pine Cone weighs about.4 oz each. Packaged in a clear cello bags. 14.95 plus flat rate shipping 11.45 first pound. your selections in the add a note box. we will send you a request for money through Paypal. You bag em, you tag em. 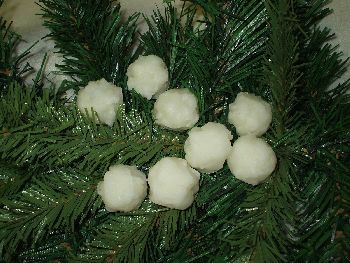 Snowballs measure between 3/4"-1" in size. And weigh about .4 oz. Approximately 41 - 42 snowballs per one pound bag.. 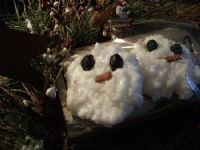 There will be no additional shipping charge for additional Snow Ball purchases up to 5 pounds. please put your selections in the add a note box. We try making sure you get an even number of each tart scent. But there may be one or two more of one or another. 1 lb Gingerbread Men per bag! 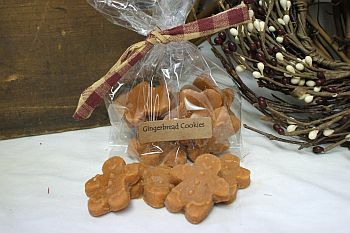 Scented in our great Gingerbread Scent! These will be packed in a ziploc bag and you will have to provide your own packaging for resale. Picture is for display only, bulk tarts are not packaged with a bow. Lisa's collection of tarts, please put your selections in the add a note box. Scents below are available for Primitive Grubby Snowmen, Snowmen Faces, Pine Cones, or Snow Balls only. 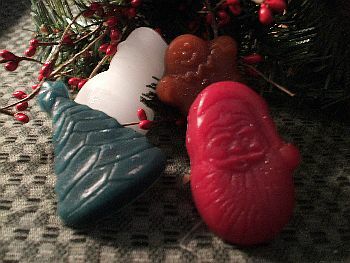 The Candy Canes and Christmas Mix come in the scents listed in their description. faux food candles at wholesale prices, make your own candle with our instructions, wax supplies and scent.